Three chronic bachelors see their life go into a tizzy when they fall in love. The film is about relationships. The film feels like it’s in slow-motion. Nothing much happens for a very long time. Pyaar Ka Punchnama works only in parts. Would manage to entice only those people who have vendetta against women. After watching the promos of 'Pyaar Ka Punchnama', one was hoping that naughty content is not just restricted to those two minutes of the playing time but also manages to extend much beyond as well. 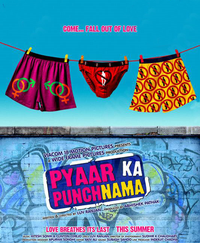 Anticipating a fun ride ahead, you step into the auditorium, only to realise that 'Pyaar Ka Punchnama' indeed lives up to the very good expectations and delivers a 'punch' which is indeed different. The film Pyar Ka Punchnama will appeal to only a section of the youth as it has no face value. The film will not do be able to do well in the theatres but might do well on television.